As I was out walking yesterday between the showers and braving the wind, I realised that I was venturing close to the rather interestingly named Sussex village of Warningcamp. Some of my regular readers will recall an old discussion in this column about the twinning of towns, the highlight of which was that “made in heaven” partnership that should exist between the towns Wankdorf in Switzerland and Happy in Texas. Wankdorf and Happy sound like they go together. This went though my mind as I approached this very pretty village. So what would be an ideal town with which it to twin? I did not come to any conclusion but will keep thinking. Anyone have any ideas? Is there a place called Gay Gordon, or is that a dance? It was as I was crossing a field on my walk, and was thinking about how nice it would be to have a deck by the river alongside one of the berths by the River Arun, as shown on my picture today. I was looking for the exit point from the field and I saw some rudimentary wooden steps in the corner which I was going to write about, but it is not my stile. More my style is to have another area dedicated to entertainment. So back to this deck. We have toyed, not very seriously, with the idea of having a boat on the river, but neither myself or That Nice Lady Decorator is prepared to take on the responsibility of having such a thing and then having to drive the damned craft along the second fastest flowing tidal river in England. There is another small complication in that I do not swim. 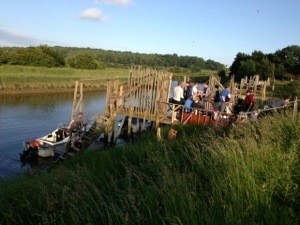 What we have identified however, after a very convivial pre dinner drink aboard one, is that we both fancy having a deck by the river for an early evening aperitif, perhaps even a vantage point for events like the Arundel Bathtub Challenge, an annual event where people build boats from bathtubs and the like and race along the river from the town to The Black Rabbit, or is it the other way around? It usually takes place as part of the Arundel Festival. As it Sunday, and a day of rest, I shall not be talking to you today about the benefits of using Currencies Direct for all your foreign exchange transactions, you may also have a day of rest. Last night then to The Swan Hotel for a pint of London Pride, before heading to the Kings Head via the Magna Tandoori takeaway. It is such a farsighted policy to encourage people to order a takeaway and eat it in the pub, so we took advantage of this and a little later met up with Colin The Pirate and his sultry goddess Sandra. The small black puppy they had with them when we last met has been replaced by a much larger dog who, if he keeps growing at that pace, will be the size of a horse by the end of the “summer”. They also like the idea of the deck, and as the drink flowed the whole concept became more and more grandiose, with awnings, a bar, outdoor furniture, heaters (obviously in the UK) and even cantilevered piles being driven into the river bed. Most of this is nonsense of course. I know that now that I have woken up sober, but I still like the basic concept so I will have to find out what we would be allowed to do, as the berths are leased from the Angmering Estate Trust. There is the small matter of agreeing this with lease holder of the berth, the lovely Laura The Cockney, but I feel she will fall prey to my persuasive charm and magnetism. That, or more likely she may take pity on an old man with delusion of how persuasive and magnetic he can be. How about Six Mile Bottom just outside Newmarket. Bit fundamental I agree but best I could do as a one off, as they say in Wankdorf.